RCM is a IT, Engineering and Health Care consulting company. They are currently trading at $5.15 (3/28/11) which is around the range they've traded since 2000 with the exception of 2008/09. The stock isn't trading at a discount to NCAV as it stands currently. What's also interesting about RCM is that it's also profitable. They earned $.44 in 2010 and about $1/sh in OCF. 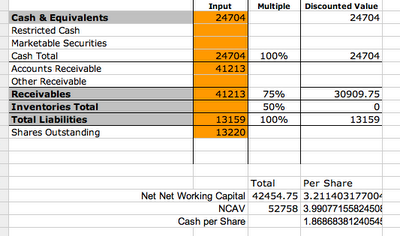 The OCF was boosted by working capital items so I wouldn't expect this to repeat in the future. One thing of note is in the CFF section they had $200k in share buybacks which effectively negated the options exercised and employee stock program. Even though this is not a huge amount it's a transfer of equity from shareholders to employees. I have put RCM on my list to research further in the future.